Celebrate Christmas at with a visit to the Nicktoons Grotto! 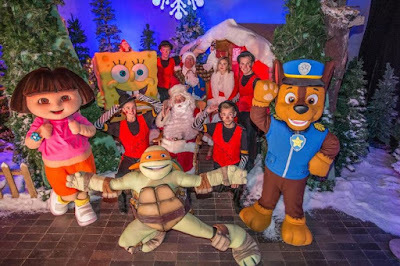 Where all your favourite characters will be getting festive - Join SpongeBob SquarePants and all his friends at Nickelodeon Land and Blackpool Pleasure Beach for fantastic festive fun then take to the ice for a cool Christmas treat. Tickets: From £13.99. Book now! Visit Santa Claus in his Grotto and receive a special Nickelodeon Gift plus a free entry to Blackpool Pleasure Beach for the whole 2018 season with the DIAMOND PASS (worth £30!) Don’t forget to enjoy a piping hot drink by travelling through the snowy winter wonderland in the Grotto to Magnolia Cafe for a Tea, Coffee or Hot Chocolate. Then take to the ice with the family at in the Pleasure Beach Arena Ice Rink! A full range of drinks and hot and cold snacks are available from the cafe bar in the Pleasure Beach Arena. The Arena also has a fully licensed bar where adults can enjoy a chilled glass of wine or beer or perhaps a warming glass of spiced mulled wine to chase away the winter chills. Your ticket includes Grotto, a gift from Santa for all children aged 11 and under, ice skating & skate hire, a FREE 2018 Diamond Pass (worth £30!) and a choice of tea/coffee/hot chocolate. ‡ 9th December Ice Skating only available until 3.00pm. † 10th/16th/17th/23rd/24th Dec – Ice Skating will only available until 1.00pm, a show ticket will be offered along with the grotto package. This will be for the 2.30pm performance* for the BIDCA Show – THE WIZARD OF OZ ON ICE, on the date of visit only. *Tickets are subject to availability. 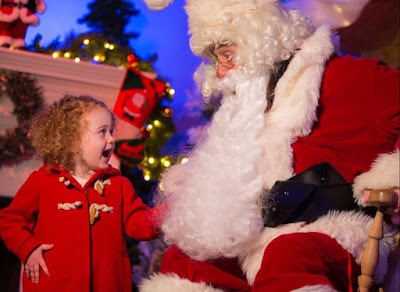 Guests/accompanying adults not purchasing the all inclusive ticket are not permitted in the Grotto and do not receive a Free Gift but may purchase a spectators pass for ice skating for £2.00. A Diamond Pass entitles you to a Pleasure Beach Pass for every day of the 2018 season. A Pleasure Beach Pass gives you admission to the park, riding on the Pleasure Beach Express, explore the Chinese Puzzle Maze, see the Spectacular Dancing Water Show, visit Bradley and Bella’s Learning Garden and enjoy the ambiance of the park. Pleasure Beach Pass holders can also get a discount off the cost of an unlimited ride wristband. Book your tickets to Nickelodeon Land and Blackpool Pleasure Beach's Nicktoons Grotto today! Follow NickALive! on Twitter, Tumblr, Google+, via RSS, on Instagram, and/or Facebook for the latest Christmas at Nickelodeon Land UK News and Highlights!